Aging parents require you and your loved ones to provide additional assistance as time goes on. But it’s not always obvious that a parent needs help. Many children and may be unaware of the growing needs of parents. In many cases, a medical issue arises before family members realize that they must provide additional help. Understanding why your elderly parent needs help and recognizing its signs ensure that they have everything they need to maintain their daily activities. It’s important that your parent is able to access the medications they need and take them as recommended by their doctors. You must monitor all prescriptions and make sure that they are consistently filled. You should also understand any potential side effects that can occur so that you can prepare for them in the future. These include dizziness, nausea, loss of memory, and a decrease in appetite. Side effects can lead to secondary health problems and should be monitored accordingly. There are a number of telltale signs that let you know when your elderly parent needs extra help. 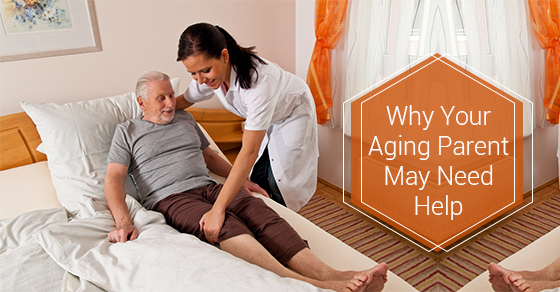 Significant changes in appearance may be an indication that your elderly parents need help at home. Observe their personal hygiene and dress for signs that help is needed. Clothes that are unwashed or wrinkled often appear when parents are unable to maintain themselves. Shirts that are worn inside out may indicate cognitive or visual problems. When elderly parents can no longer maintain their home environment, trash may pile up and dust can accumulate on furniture. Parents who regularly cooked their own food in the past often resort to eating packaged foods out of convenience. This may be a sign that they need help to prepare meals. Although clutter is common in many homes, too much can indicate an inability to put items away. Clutter can put people at risk of tripping and falling. So it’s important to keep an eye out on the amount of things lying around the house. Bumping into furniture happens to most everyone. But frequent injuries may be a sign that someone needs extra help. Bruises, cuts, and burns should be noted. If these occur on a frequent basis, you’ll need to look into what’s causing them. As elderly people lose mobility and balance, they often must grab furniture or stabilize themselves against walls when moving around. This is a clear indication that assistance needs to be provided to help them move easily and without the risk of injury. There are many reasons why an elderly parent needs extra help. Understanding the factors that contribute to this growing need, and recognizing the signs that changes need to be made is the first step in beginning to develop and implement strategies that improve the quality of life and wellbeing for your parent.